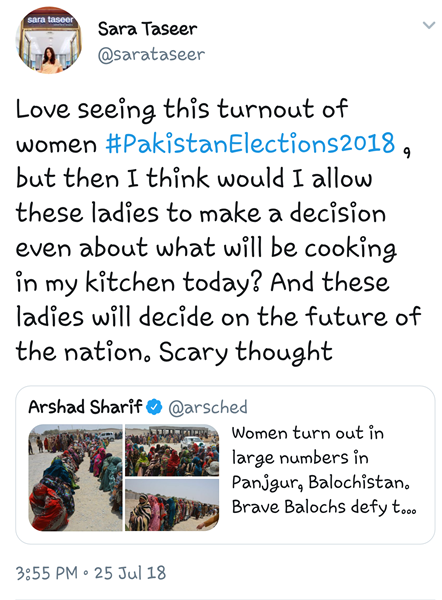 Sara Taseer stated she would not be too sure about letting these woman decide what to cook in her kitchen, let alone letting them decide the fate of the country. With countless security threats lingering around the time of elections every five years, along with general political uncertainty, many citizens are afraid to step out of their comfort and safety zones in order to fulfil the responsibility of casting their votes. There has been a deadly and heart-breaking series of bomb blasts that have taken place in Quetta, killing numerous civilians and politicians, especially the most recent one taking place directly outside a polling station on Election Day. At a crucial time like this in the country, where voter turnout has been relatively low in the past, perhaps encouragement to the masses from every corner of the nation is needed more than discouragement. To everyone’s surprise, that too a pleasant one, many young and elderly women came out to vote in the highest of numbers this time. In fact, in this year’s tightly contested elections, there was a phenomenal history-making turnout of voters from conservative areas, where women are typically not allowed to partake in any activity that takes place outside the four walls of their homes. According to the Election Commission of Pakistan (ECP), 46.73 million female voters cast their vote nationwide. One such example is of the women in Panjgur, Balochistan, who came out in large numbers despite serious death threats, especially after the Quetta attack earlier that day. In response to this news, many people went on social media to hail this as a big achievement. Women turn out in large numbers in Panjgur, Balochistan. However, Sara Taseer – daughter of the slain Governor of Punjab, Salmaan Taseer – went on to tweet a highly ignorant, elitist, sexist, and classist comment, targeting those very brave women instead of acknowledging their effort. Sara stated she would not be too sure about letting these woman decide what to cook in her kitchen, let alone letting them decide the fate of the country. Funnily enough, this came across like an ironic joke, not only because it’s highly sexist, but also because Sara doesn’t even reside in the country she is so “concerned” about. Her tweet is sexist because being a woman herself, she assumes that is all these women are capable of, and classist in the purest sense, as she automatically presumes that these women would be servants working for her, and goes on to generalise that all underprivileged people must be “uneducated”. Sara Taseer wasn’t in Pakistan to cast her vote but she is questioning the right of thousands of women who live in Pakistan and despite facing difficult circumstances every single day still showed up to exercise their democratic right today. Poetic really. To defend her stance later, she tweeted that like Plato, she believes only the “educated” should be allowed to vote, which in my opinion is quite ironic and contradictory, for if this is the kind of mentality the so-called “educated” elites are banking on to be considered above the rest, then I deeply fear what’s to come. Following this tweet, there was a huge uproar unveiling Sara’s elitist views regarding women of the tribal area. People often say that with money comes power, and with power comes responsibility. However, this particular case shows precisely the opposite of that saying, considering Sara has acted rather irresponsibly, shaming an already marginalised sect of Pakistani society; looking down upon them simply because of their socio-economic status being inferior to hers. Oh and demeaning the economically underprivileged by saying you wouldn't let them decide what to cook let alone vote, and that too underprivileged women who are already a marginalised group in the country due to their gender is what you call "elevated thought"? Laughable. I am so proud of my women from the tribal areas who defeated bigotry & patriarchy & jumped on the bandwagon of initiating a change by casting vote. While Sara Taseer eats her designer jewerley in lunch away from Pakistan as she's too privileged to eat normal food. One would assume Salmaan’s daughter – a man who gave his life defending a poor Christian woman from being falsely accused against Pakistan’s draconian blasphemy laws – would not publicly go against the core principles of humanity that he defended so fiercely. Additionally, Sara’s tweet and her subsequent defence of her own ignorance proves that money cannot buy integrity. The fact that there were 1.81 million registered female voters in Balochistan proves that these women were clearly aware enough of the significance of their vote and of the elections in general and had a vision of change for their nation, which is why they came out to contribute their vote in these trying times. Women belonging to the tribal areas are like all other women in Pakistan – they own the right to choose their leader. There is no reason to mock others because of their presumed lack of education, simply because they are unable to afford something as basic as fundamental and constitutional rights, or are not allowed to exercise that right because of the suffocating environment they are raised in, while also not having access to an educational institute or proper means of transportation to get to a school in the first place. There are so many incremental factors, like the ones stated above, which cannot be overlooked or demeaned. Sure, class privilege is great. You get to enjoy all possible perks in life, but don’t let that privilege desensitise you to the point that you forget other people’s struggles or demean others who haven’t had the same opportunities as you to thrive. Instead, use your education and power in a positive way. Women in particular need to start seeing more clearly across the spectrum, instead of belittling other women based on their different intersectionalities, including gender, class, socio-economic status, education, and so on. We need to be more understanding, accepting, and analytically smarter to able to progress, not only as a gender but also as a nation. We expect our government to incorporate more policies that will protect women and other at risk minorities, but if we fail to see other’s strengths and weaknesses for what they are, the factors and reasons leading up them, then there will be no argument to make. Making isolated comments like Sara did is a clear indication that there is so much work to be in done in regards to forming true solidarity amongst women, especially between the elite and lower classes. 1. Education does not translate into informed and rational voters. Many educated voters have voted for regressive, xenophobic and violent regimes throughout the world.